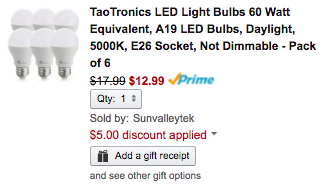 Sunvalleytek via Amazon offers the TaoTronics 6-pack of TaoTronics A19 60W LED Lightbulbs for $12.99 Prime shipped. That’s good for $5 off the regular price, down $4 from our previous mention and the best available. Ditch your standard lightbulbs and make the jump to LED. You’ll be able to cash in on significant energy savings over the 25,000 hour life of these bulbs. The 5000K temperature is made to replicate a warmer daylight look. Rated 4.8/5 stars by 792 Amazon customers. A Bright Choice Switch to an energy efficient, vision-friendly LED lighting with a TaoTronics LED light bulb. Each bulb has brightness equivalent to a 60-watt incandescent light, but only consumes 20% of its power. Save on energy and money. Cost Saving Not only do TaoTronics LED light bulbs run on less power, they also last longer than any incandescent light bulb. LED bulbs have a lifespan of up to 25,000 hours; for an average use of 3 hours per night, that is more than 22 years before you need to switch to another light. Natural Daylight At 5000K of color temperature, the bulb emits a bright white color that is similar to daylight. With a much higher color consistency and CRI index, LED lighting is more comfortable to your eyes than traditional light.